Aikido Warrior Dojo had the pleasure of having Peter Kelly Sensei as guest senior instructor for its Saturday class on 17 May 2014. Peter Sensei has recently been appointed by the Founder of Aikido Yuishinkai, Master Koretoshi Maruyama, as the Technical Officer for the newly reformed Aikido Yuishinkai Australia. 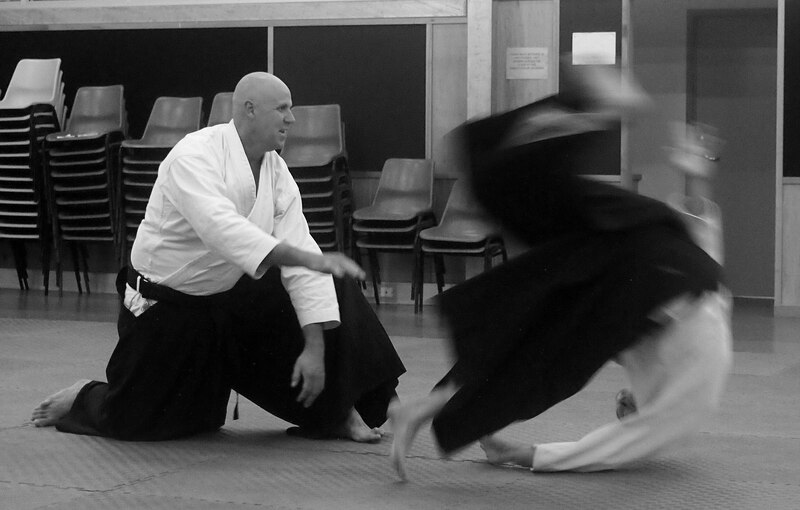 Peter Sensei has the daunting task of ensuring that Maruyama Sensei’s teachings are correctly followed and that appropriate standards are maintained in all Aikido Yushinkai dojos in Australia. 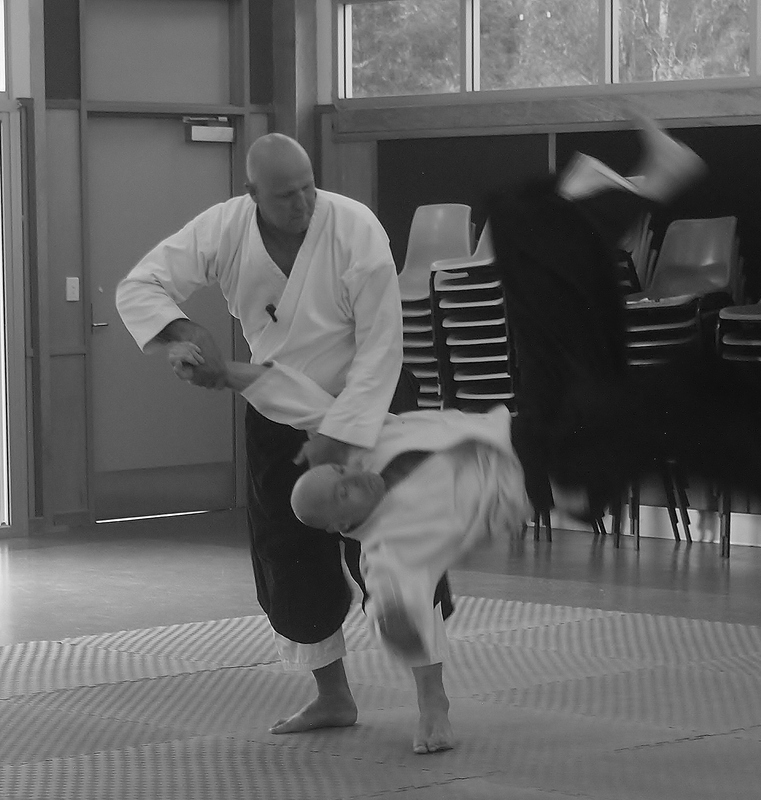 In addition to the new appointment, Peter Sensei continues to be the Head Dojo Instructor for the Aikido School of Excellence in Tasmania and the Chief Instructor for Aikido Yuishinkai Tasmania. In his spare time, he is organising and hosting this year’s National Seminar. Given this backdrop, we were particularly appreciative that Peter Sensei somehow found the time to attend our dojo, as part of a fleeting weekend visit from Tasmania no less, to take a Saturday class. Not surprisingly, we had a big turnout at the dojo, not only from our own members, but instructors and members from a cross-section of Brisbane Aikido Yuishinkai dojos. Themes explored in the class included developing correct footwork, entering, body posture, relaxed application, sinking and ukemi skills consistent with the focus of our School to discover and explore the Aikido of O’Sensei. These themes were examined through a wide array of techniques and attack responses, including koshinage, kokyunage and ikkyo applications. A blog alone can not do justice to the critical lessons learned at the class. Fortunately, a video of the class was organised. Over the coming weeks, major aspects of the class will be examined on this site and supported by the class video as an instructional aid. In the meantime, see below a collection of just some of the many photos taken of the class by our dojo photographer, Eden Grant. If those attending would like a copy of any photograph, please email the dojo and we can arrange for it to be electronically sent to you. Thanks also to the Dojo admin team who keep that side of things humming so the rest of us can just focus on the Aikido. Finally, big thanks to Peter Sensei for taking the time to travel down from Tasmania for the weekend to give such an excellent and inspiring class. I’ve already received emails asking if I know when you will be visiting Brisbane again.